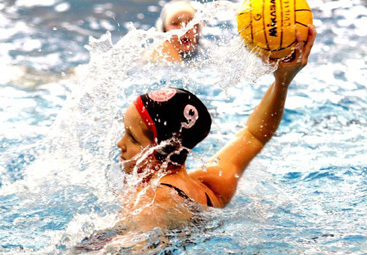 MAKING A SPLASH: Sophia Monaghan delivers the ball in action for the Lawrenceville School girls’ water polo team. Monaghan, who also stars for the Tiger Aquatics program based at Princeton University, will be competing on the international level next month as she plays for the USA Women’s Junior National Team at the Under-19 Pan American Championships in Canada. As a ten-year-old, Sophia Monaghan had her sights set on being a swimming star. But when her NJ Stingrays swim club coach suggested that she try out for the team’s water polo program, Monaghan decided to broaden her horizons. After learning the ropes of the game with the Stingrays program, Monaghan stepped up and joined the more intense Tiger Aquatics program based at Princeton University. “The Stingrays is [for] a lower age group, so once you get to be around thirteen or fourteen, there aren’t many kids playing at a higher level,” said Monaghan. Improving her game through exposure to such competition, Monaghan, 16, is now fully committed to being a water polo star. Monaghan matriculated to the Lawrenceville School, in part, because it boasts the strongest high school program in the area and is a rising senior star for a Big Red girls’ water polo squad that went 17-3 last fall. She has ratcheted up her involvement with the Tigers program, practicing with the club several days a week during the year and throughout the summer. For the past four years, Monaghan has gone to the Junior Olympics, and last year, her team placed sixteenth in the platinum bracket (seeds 1-24), the best-ever result for a women’s east coast team. “It was a huge accomplishment for us, and this year we’re just hoping to build off of that,” said Monaghan of the competition, which will take place in early August in Northern California. Acknowledging that the west coast is the hotbed for the sport, Monaghan has to adjust her game when she is going against California players. In east coast competition, Monaghan generally plays the center position, where the strongest players are placed and most of the goals are scored, but when going against players from the west coast, her position shifts to being a defender. “I’m used to being the biggest or fastest or strongest, but when I go out to California, I’m not even close to the best, and it gave me a reality check of how many incredible players there are,” said Monaghan, who still swims competitively, starring for Lawrenceville during the winter and the Nassau Swim Club Lemmings over the summer. Later in August, Monaghan will be competing at an even higher level as she heads to Canada as part of the USA Women’s Junior National Team that will play in the Under-19 Pan American Championships. “It’s really exciting to think that you’re competing to play for your country,” said Monaghan, reflecting on the tourney which will take place from August 10-18 at the Olympic Park’s Sports Center in Montreal, Quebec. After all the progress Monaghan has made in water polo, she is looking forward to an exciting future in the sport which could include playing in college for one of the west coast powers in the sport. “If I go out to play water polo on the west coast, it’s going to be to get a good education, because that’s how I’m going to get a job,” said Monaghan, who was named to the 2010-11 USA Water Polo All American list which honors student athletes who excel in both the pool and the classroom.